The name alone exudes that quirky, fun and irreverent attitude exemplified by the equally witty names of the dishes. Chef Tatung pokes some serious fun at comforting local flavors, and why not. Dining should be fun, and a little laugh between bites just adds to the fun dining experience at Takaw! Filipino Eatery. While the name of the new restaurant and the dishes may seem good humored, the flavors are intensely real. And serious. You can have the usual gambas, but Chef Tatung just won't have any of that at Takaw! Filipino Eatery. Here's his over-the-top leveled-up version, the Hipon Na, Utak Talangka Pa (P 380) with succulent shrimps sauteed with pig's brains and crab fat for a double dose of richness. It's this no holds barred approach to local cuisine that makes Takaw! Filipino Eatery hit the spot with inventive dishes like this. Chef Tatung is fully committed to serious flavors, and his Hipon Na, Utak Talangka Pa perfectly reflects this approach. The buttery and creamy texture of the pig's brain and the briny notes of the crab fat combine for the ultimate in savory decadence, and Chef Tatung really isn't kidding around with bold and intense flavors. Add some of that sauce on steamed white rice and you'll forget the dish actually has some fresh and plump shrimps. Fresh Na Fresh, Bes! (P 190), the homestyle lumpiang sariwa stuffed with sauteed fresh vegetables covered in a sweet garlic sauce is another refreshing starter before the mains at Takaw! Filipino Eatery. The flavors are clean and delicate, with the freshness of the vegetables delivering all the flavors followed by the garlic sauce for that perfect finish. If the name of the dish doesn't get you, one bite will. The Escabetcha By Golly Wow (P 400) with crispy whole fried tilapia draped in a sweet and sour sauce topped with peppers and scallions brings both texture and flavor recreating another beloved classic. Perfectly crisp, the subtle notes of the mildly sweet fish are perfectly complemented by the sweet and sour sauce that just begs for extra rice. I Love You, Pangga (P 350) is Chef Tatung's version of the local Mindanaoan chicken pianggang made with flavorful blackened coconut cream curry. Sweet, creamy and savory with just a whisper of heat from the fresh and fiery local chili, the flavors of the tender chicken are kicked up by the rich nutty notes of the coconut for another must-try dish at Takaw! Filipino Eatery. A known advocate of local and indigenous cuisine, Chef Tatung showcases regional flavors as well at his newest dining concept. Kaldereta ni Lolo (P 380) is from a cherished family recipe topped with lots of cheese for nostalgic homestyle flavors. The fork-tender beef draped in a rich sauce with sweet and smoky peppers, carrots and olives deliver a comforting richness with sweet fried plantains completing the flavors. There's just no holding back on rich flavors, not at Takaw! Filipino Eatery. The amusing and wittingly named I Caught You Laing (P 160) recreates the iconic Bicolano vegetable dish thickened with coconut cream and fiery chili topped with crispy dilis. The nutty richness of the coconut cream are tempered by the bold salty notes of the crisp dilis for balanced flavors. Masterfully prepared, this one's legit. And another personal favorite. Pata Don't Preach (P 550 Regular/P 680 Special) is Chef Tatung's inventive spin on the traditional crispy pata that's crispy and spicier with loads of garlic for that flavorful finish. And no, Chef Tatung will be the first to say this isn't guilt-free. Far from it. But if you want the classic crispy pata, you can try the Regular variant. Nagbabagang Manok (P 380) is a sizzling barbecue chicken dish slathered in a rich and spicy bbq sauce topped with garlic that just looks as good as it tastes. Tender and juicy, the local bbq sauce just completes the dish with its deep, smoky and savory sweetness. Served on a sizzling hot plate, it just doesn't get better than that. But there's more. The Kare Pa 'Teh? (P 320) is as traditional as it gets. You don't mess around with local favorites like the kare-kare. 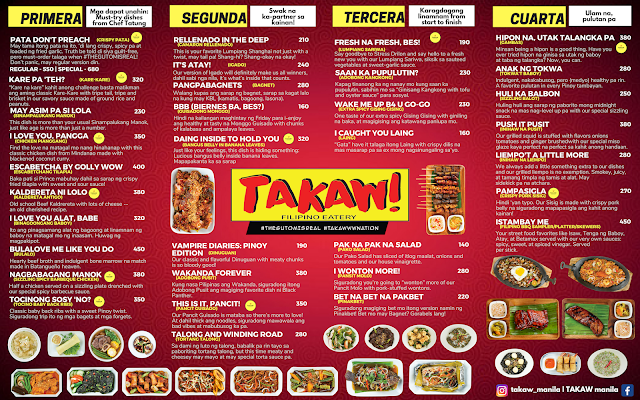 Prepared the old-fashioned way, everything you love about the local kare-kare is replicated at Takaw! Filipino Eatery. ...best paired with Chef Tatung's Premium Ice Cream (P 110) in uniquely Filipino flavors. Here's an insider tip. Pair your Turones de Laguna with the Kamote Q Ice Cream. Trust me. It's good to see Chef Tatung back with another innovative concept combining comforting and traditional flavors with just a touch of wit and humor for a satisfying dining experience at Takaw! Filipino Eatery. Takaw! Filipino Eatery is located at the Ground Floor, Theater Mall, Greenhills, San Juan or call 903-4580 for inquiries.